INTRODUCTION: In communication process, feedback plays a major role. Usually, a formal/informal feedback is collected from students on their experience and understanding about the tasks given by the mentor to assess the learning process. Receiving high-quality feedback (positive or negative) is valuable from multiple perspectives. Students may or may not enjoy sessions on innovative teaching–learning methods; in that case, feedback helps to modify it into a more effective and acceptable method of teaching. METHODOLOGY: With an objective to understand the students' perception on a smartphone app in community-based research, a cross-sectional study was planned among undergraduate students posted for the re-orientation of medical education. Epicollect5, a mobile app, was used for data capture. Students were requested to submit their feedback by using the same app which they had used during the survey. The received feedback was analyzed and presented in proportions. RESULTS: Students shared that the new tool was easy to install (97.5%), user friendly (100%), saved time in data collection and data entry (100%), and they also missed the usual practice of paper-based questionnaire survey (12.5%) and data entry in excel sheet (7.5%). CONCLUSION: The students liked and enjoyed the paperless method of data collection and entry which saved time and improved the quality of the data. They were also interested to learn more on the designing or framing the questionnaire in app and planned to use the app in future research. The feedback conveyed the immense welcome for new technology by the students into medical curriculum. Students' feedback is a common and frequent practice in the field of education. Whenever there is sharing of information or communication, the feedback from the receiver is very important in the process of communication. Usually, a formal or informal feedback is collected from the students on their experience, knowledge, and understanding in the tasks given by the mentor to assess the learning process. Feedback is also a vital component of teaching, training, and learning in the health profession. Receiving high-quality feedback (positive or negative) is valuable from multiple perspectives. In a medical school, students are required to provide face-to-face feedback for better understanding of their perception for the activities assigned or taught to them. Students may or may not enjoy sessions on innovative teaching–learning methods; in that case, feedback from students help to modify it into a more effective and acceptable method of teaching.,,, If the teaching method is based on their feedback, students actively take part in planning, execution, and evaluation processes. Feedback highlights the critical challenges that need to be focused by the faculty and medical education unit. Many studies have shown that if education is research oriented and field based, students will not only gain knowledge but also learn the clinical skills and research methodology., During the re-orientation of medical education (ROME),,, posting of undergraduate medical students in the Department of Community Medicine, a field-based activity was planned and data were collected by the students using a smartphone app under the guidance of faculty and postgraduate students. Keeping the importance of students' feedback in mind, the current study was planned with an objective to understand the students' perception on using smartphone app as a tool for data collection in the field of community research. As per the objective, a cross-sectional study was conducted among the undergraduate medical students posted in the department of community medicine for Re-Orientation of Medical Education (ROME). The students were posted for 1 month; during the posting, medical research was practically introduced to them. All the students were divided into four groups with a postgraduate student and a faculty as the in-charge of each group. Data collection, data entry, data analysis, report writing, and community health intervention (health education activity) were all done by the actively participating students under the supervision of faculty and postgraduate students. In order to reduce the burden of paper-based data collection and data entry into the computers, a new tool was introduced during the ROME 2018 posting. Mobile phones were used in the place of printed questionnaires. Epicollect5, a free software (a mobile app) developed by Imperial College London funded by the Wellcome trust, was used for data capture, i.e., for data collection as well as data entry. The Epicollect5 software, which is very easy to install in smartphones, enables the managers to identify the errors and allows mid-course correction within minimal time. The chances of data entry error or missing data could be avoided by applying checks at the data entry point. The data could be transferred to a central server when the device comes under a network coverage and connected to the Internet (data capture can be done offline, without network and the Internet); therefore, the data are stored and backed up securely and the risk of data loss is very minimal. The mobile application was designed as per the questionnaire of the research study. At the end of the posting, one group of students were requested to submit their feedback about their perception and experience of using a mobile/smartphone app for data capture in this community-based research. The feedback was also received by the same smartphone app (Epicollect5) which they had used during the survey. All the students of the group were requested to participate and submit their feedback, i.e., universal sampling was done. The received feedback was extracted in Excel sheet by the administrator of the Epicollect5 app, the postgraduate student. The extracted data were analyzed and presented in frequencies and percentages. All the students of the batch were divided into four groups, 41 students were posted in one group for the field research activity; out of them, forty students provided feedback in the app. Students who submitted their feedback (100%) shared that the new tool was user friendly, saved time in data collection and entry, and they missed the usual practice of paper-based questionnaire survey (12.5%) and data entry in Excel sheet (7.5%) [Table 1]. When students were requested for rating (poor to excellent) on the experience of using a mobile/smartphone app for data collection in this community-based research, 90% of the students gave feedback of excellent and very good experience on using a new tool for data collection and entry. On overall experience in ROME posting which includes field survey, analysis, and report writing, the ratings were excellent, very good, and good at 47.5%, 45%, and 7.5%, respectively [Table 2]. 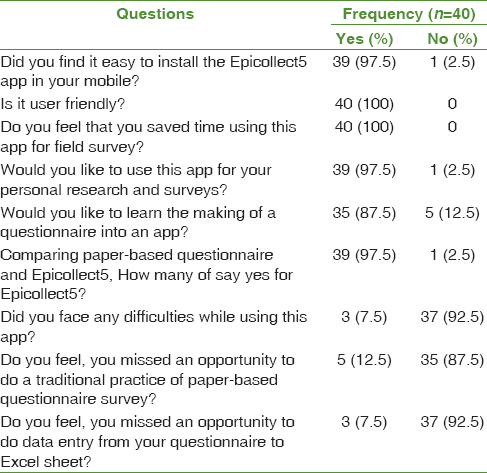 Feedback on students' experience/perception regarding the use of a mobile app in research was obtained at the end of the ROME posting in the Epicollect5 app, which they had used for data collection and entry. Among the students who submitted their feedback, majority of the students found the app to be very easy to install and user friendly, i.e., easy to use during research. Students expressed their opinion to use such technology of data capture for their personal surveys and research in the future and would also like to learn the construction of the questionnaire in the application as they felt it is better over the traditional practice of paper-based data collection on field. They shared that as data entry in this application does not require mobile network, this tool can be used anywhere at any time. However, to upload the offline data to cloud, it requires Internet connection. Among the group of students, 7.5% of the students faced few difficulties while using the application because they were not able to upload the data on time due to the same mobile network issues. Any error during the data entry can be checked early and corrections can be done at the same time, so quality of the data would be ensured. This new method of data capture (paperless data capture using a mobile phone/smartphone) was introduced for the first time to the undergraduate students in this community-based research. Few students (12.5% and 7.5%, respectively) felt that they missed the opportunity of paper-based data collection and data entry into Excel sheet. A batch of undergraduate medical students were posted for the ROME posting (divided into four groups); the feedback study was conducted only for one group of students, which was the limitation of the study. All the students in the group had been requested to submit their feedback in the same app used for research with universal sampling method, but the response was received from only 97.5% of students. The feedback received from the students on a new tool (mobile app) for data collection and data entry in this community-based research showed that the app is very easy to install and user friendly. The students liked and enjoyed the paperless method of data collection and data entry which saved time and improved the quality of the data. They were also interested to learn more on the designing or framing the questionnaire in app and planned to use the app in their future research. Few students missed the traditional method of paper-based data collection method also. The feedback conveyed the immense welcome for new technology by the students into medical curriculum. However, introducing new technologies into medical curriculum should not inhibit students from learning the traditional practices. The authors would like to acknowledge the students who had actively participated in the ROME posting and submitted their feedback for using an app in this community research. Park K. Park's Textbook of Preventive and Social Medicine. 24th ed. Jabalpur: Banarsidas Bhanot Publishers; 2017. Telio S, Ajjawi R, Regehr G. The “educational alliance” as a framework for reconceptualizing feedback in medical education. Acad Med 2015;90:609-14. Bird EC, Osheroff N, Pettepher CC, Cutrer WB, Carnahan RH. Using small case-based learning groups as a setting for teaching medical students how to provide and receive peer feedback. Med Sci Educ 2017;27:759-65. Mishra AK, Manikandan M, Kumar R, Chauhan RC, Purty AJ, Bazroy J. Concomitant use of handouts, group and panel discussion as a teaching technique for undergraduate medical students. Int J Innov Med Educ Res 2016;2:18-22. Stalin P, Bazroy J, Singh Z, Divija R, Velavan A, Veerappan I. Evaluation of correlated integrated teaching programme among undergraduate medical students. J Res Med Educ Ethics 2014;4:60-4. Mahajan PB, Bazroy J, Singh Z. Impact of team teaching on learning behavior and performance of medical students: Lessons learnt from a teaching medical institution in Puducherry. Health Agenda 2013;1:104-11. Kar SS, Premarajan KC, Subitha L, Archana R, Iswarya S, Sujiv A, et al. Student-centred learning in community medicine: An experience from Jawaharlal institute of postgraduate medical education and research, Puducherry. Natl Med J India 2014;27:272-6. Al-Mously N, Nabil NM, Al-Babtain SA, Fouad Abbas MA. Undergraduate medical students' perceptions on the quality of feedback received during clinical rotations. Med Teach 2014;36 Suppl 1:S17-23. Deo MG. Need for research oriented medical education in India. Indian J Med Res 2009;130:105-7. Chauhan RC, Purty AJ, Singh Z. A study on usefulness of re-orientation of medical education (ROME) posting in enhancing the research oriented knowledge among undergraduate medical students. Int J Pharm Med Res 2013;1:24-6. Mahajan PB. ROME scheme: From reorientation to research oriented medical education, a new beginning. Indian J Med Res 2010;132:110. Vasudevan S, Sureshbabu J, Senthilvel S. Medical education: Reorientation of medical education program training and finding knowledge among under graduate medical students in a tertiary care teaching hospital in South India. J Dent Med Sci 2015;14:103-13. Konduru RK, Mishra AK, Manikandan M, Bazroy J. ROME: A tool to train under graduate medical students as community health care providers. Int J Community Med Public Health 2018;5:1181-4.